• The Inter-Industry Conference on Auto Collision Repair (I-CAR), founded in 1979, is a not-for-profit international training organization dedicated to improving the quality, safety and efficiency of auto collision repair. • Towing and Recovery Association of Georgia. An association of towing companies joined together to continuously improve the Industry and better serve the motoring public. • The towing and certification training program WreckMaster that teaches the latest skills and techniques in the towing and recovery industry. 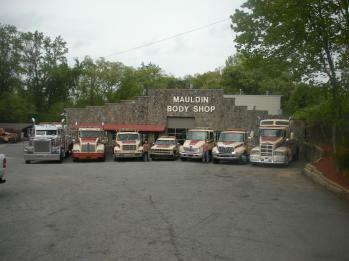 Mauldin Body Shop was opened at it's present location in 1961 by it's founder and owner Herbert J. Mauldin. The company is currently managed by his daughter Debbie Mauldin Weaver. Her husband John Weaver is also involved and manages the towing aspect of the business. They both have been actively involved with the company since the early 1970's. Their daughter Angela Weaver Reece joined the company upon her completion of college in 2001 and became the accounting specialist. She is also very active with the towing and recovery portion of the business.